A sweet good night’s sleep can do wonders for your hormone balance and your fertility. During the deep stages of sleep our bodies are busy releasing a number of key hormones. Which is one of the reasons that people with chronically poor sleep habits have lower levels of DHEA a growth hormone, released by the adrenal gland and instrumental in tissue and cell repair, bone growth and your overall energy level. Although supplementing with DHEA might temporarily make you feel more energized, it won’t address the underlying depletion. In fact it might allow you to continue the lifestyle that triggered the problem. -Light sleepwear and a cool, fully darkened room is ideal. If that’s not possible, a sleep mask and a white noise machine can help. 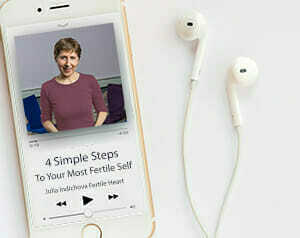 -At least one preferably two hours before sleep, unplug all gadgets, turn off all light emitting screens, dim the lights and settle in for some fertility – friendly activity of your choice. This might be a good time for your imagery practice and some journaling, or any other calming, pleasurable activity. -We already know that alcohol is not a fertility friendly beverage. It’s true that a glass of wine in the evening can feel like a perfect way to unwind, and may have a temporarily relaxing effect since it slow you down and suppresses brain function, but alcohol acts as a stimulant as it gets metabolized and you might know from experience that it does not promote the most restorative sleep. -Nicotine has a similar effect on sleep in addition to a long list of other harmful effects. -Caffeine can interfere with quality sleep even if you drink it early in the morning. Decaf coffee is not caffeine free. So if you have trouble falling or staying asleep, it would make sense to switch to any one of the delicious coffee substitutes such as Dandy Blend, a wonderful drink made from dandelion root, or any number of herbal teas. -Eating a large meal before bedtime will keep your body busy digesting rather than doing what it’s meant to do while you’re asleep: balancing and repairing what needs attention. So plan your meals with some foresight. You also don’t want to go to bed hungry and then go searching for a snack in the middle of the night. -Consider including in your evening snacks and meals foods rich in B6, a vitamin needed for the production of melatonin, the hormone that controls your sleep and wake cycles, such as bananas, cantaloupe, avocadoes, oats. potatoes sweet potatoes cooked with skin; walnuts, hazelnuts & pistachios, The most widely known sleep inducing drink is tart cherry juice. -In the Fertile Heart OVUM practice, Body Truth is part of our sleep hygiene self-healing regime. Going to bed after an upsetting phone call or lying on your pillow composing in your mind a letter of resignation in response to your boss’s insensitive remarks, isn’t going to support a good night’s sleep. So let your body tell it like it is. Giving your body-child a few minutes of quality time to speak the truth can make for a far more sleep friendly inner space. Welcome home, Cry for Justice, Rock the Baby, UnconditionalGratitude, are some of the Body Truth sequences that can be particularly helpful for this purpose. Okay, that’s a good start, sweet dreams everyone!